(CNSNews.com) - Florida and Texas, according to data released today by the Bureau of Labor Statistics, not only led the nation in the number of nonfarm jobs they added in the year running from September 2017 to September 2018 but also added the greatest number of jobs to their states in any September-to-September period on record. 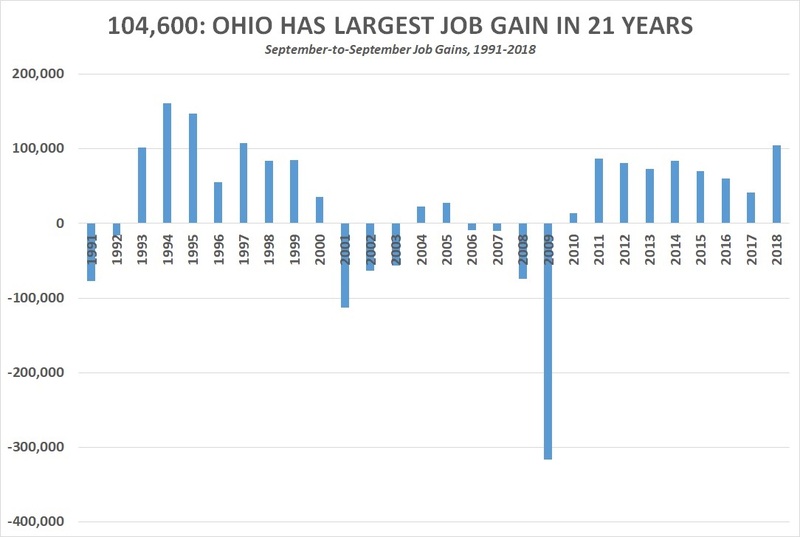 Ohio and Pennsylvania—sometimes considered part of the nation’s “Rust Belt”—also saw significant job gains from September 2017 to September 2018, with Ohio showing the largest increase for its state in 21 years and Pennsylvania showing the largest increase in 18 years. 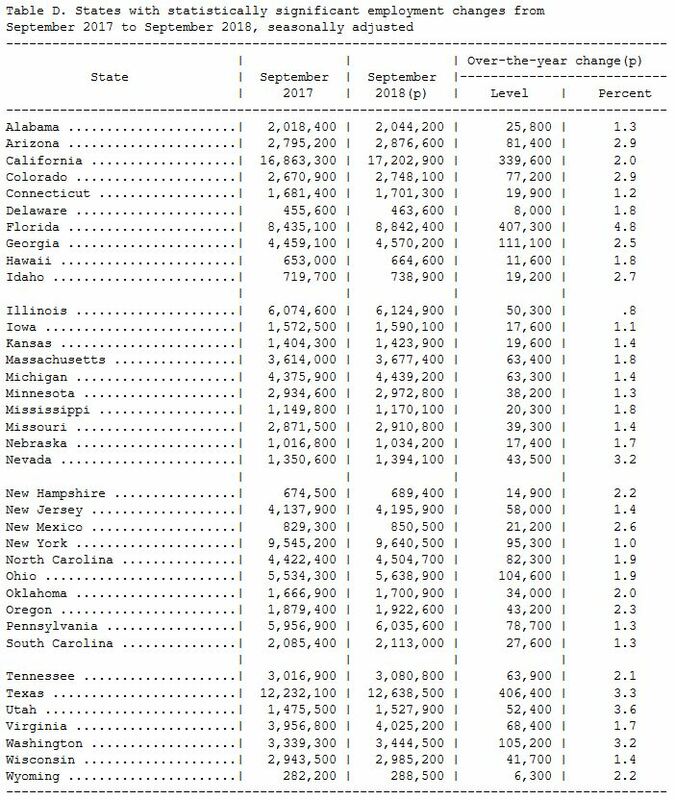 “Thirty-seven states had over-the-year increases in nonfarm payroll employment in September,” BLS said in its state employment report. “The largest job gains occurred in Florida (+407,300), Texas (+406,400), and California (+339,600). The largest percentage gain occurred in Florida (+4.8 percent), followed by Utah (+3.6 percent) and Texas (+3.3 percent). The unemployment rate in Florida was 3.5 percent. In Texas, it was 3.8 percent. In California, it was 4.1 percent. Florida’s jobs grew 4.8 percent during the latest September-to-September period. Texas’s jobs grew 3.3 percent. California’s jobs grew 2.0 percent. In Florida, the number of nonfarm jobs rose from 8,435,100 in September 2017 to 8,842,400 in September 2018—accounting for the record 407,300 increase. From September 2016 to September 2017, the number of jobs in Florida actually declined by 19,100, according to BLS, which has posted historical employment data for Florida going back to 1990. 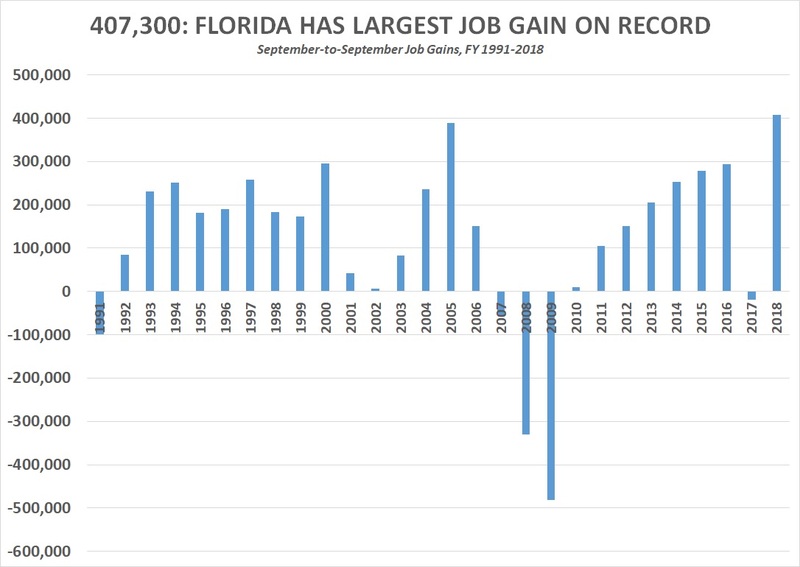 Prior to fiscal 2018, the largest September-to-September jobs increase on record in Florida took place in 2005, when the state added 389,000 jobs. In Texas, the number of jobs rose from 12,232,100 in September 2017 to 12,638,500 in September 2018—accounting for the record 406,400 increase. 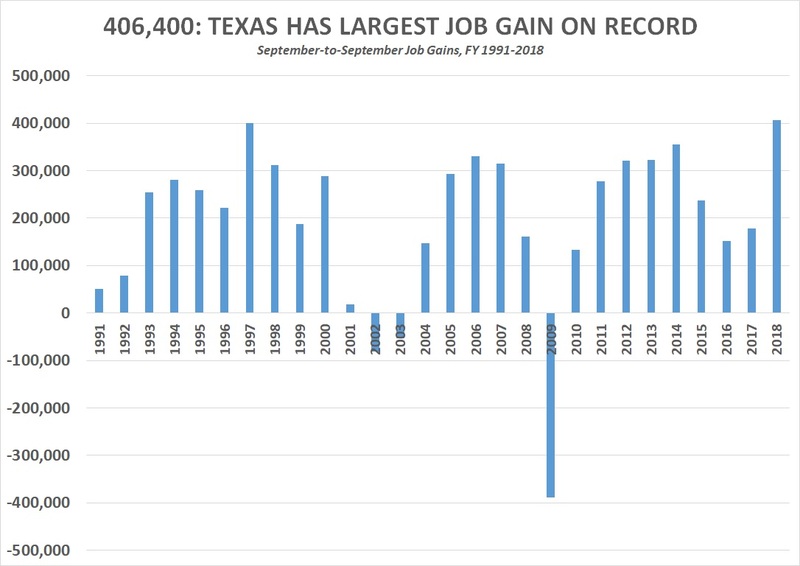 Prior to fiscal 2018, the largest September-to-September jobs increase in Texas (in the years since 1990) took place in 1997, when the state added 399,900 jobs. The 78,700 jobs that Pennsylvania added was the most it has added in any September-to-September period since 18 years ago in 2000. That year, Pennsylvania added 117,700 jobs.